The resilience of coral reefs is the biological ability of coral reefs to recover from natural disturbances such as storms and bleaching episodes. Resilience refers to the ability of biological or social systems to overcome pressures and stresses by maintaining key functions through resisting or adapting to change. Reef resistance measures how well coral reefs tolerate changes in ocean chemistry, sea level, and sea surface temperature. Reef resistance and resilience are important factors in coral reef recovery from the effects of ocean acidification. Natural reef resilience can be used as a recovery model for coral reefs and an opportunity for management in marine protected areas (MPAs). Many corals rely on a symbiotic algae called zooxanthellae for nutrient uptake through photosynthesis. Corals obtain about 60-85% of their total nutrition from symbiotic zooxanthellae. Slight increases in sea surface temperature can cause zooxanthellae to die. Coral hosts become bleached when they lose their zooxanthellae. Difference in symbionts, determined by genetic groupings (clades A-H), may explain thermal tolerance in corals. Research has shown that some corals contain thermally-resistant clades of zooxanthellae. Corals housing primarily clade D symbionts, and certain types of thermally-resistant clade C symbionts, allow corals to avoid bleaching as severely as others experiencing the same stressor. Scientists remain in debate if thermal resistance in corals is due to a mixing or shifting of symbionts, or thermally resistant vs. thermally-sensitive types of zooxanthellae. Species of coral housing multiple types of zooxanthellae can withstand a 1-1.5 °C change in temperature. However, few species of coral are known to house multiple types of zooxanthellae. Corals are more likely to contain clade D symbionts after multiple coral bleaching events. Research studies of the Mediterranean species of coral Oculina patagonica reveal that the presence of endolithic algae in coral skeletons may provide additional energy which can result in post-bleaching recovery. 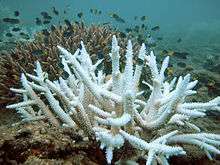 During bleaching, the loss of zooxanthellae decreases the amount of light absorbed by coral tissue, which allows increased amounts of photosynthetically active radiation to penetrate the coral skeleton. Greater amounts of photosynthetically active radiation in coral skeletons causes an increase in endolithic algae biomass and production of photoassimilates. During bleaching, the energy input to the coral tissue of phototrophic endoliths expands as the energy input of the zooxanthellae dwindles. This additional energy could explain the survival and rapid recovery of O. patagonica after bleaching events. In an attempt to prevent coral bleaching, scientists are experimenting by "seeding" corals that can host multiple types of zooxanthellae with thermally-resistant zooxanthellae. MPAs have begun to apply reef resilience management techniques in order to improve the 'immune system' of coral reefs and promote reef recovery after bleaching. Representation and replication: Coral survivorship is ensured by representing and replicating resilient species and habitats in an MPA network. The presence of resilient species in management in MPAs will help protect corals from bleaching events and other natural disturbances. Critical areas: Conservation priority areas provide protection to critical marine areas, such as sources of larvae for coral reef regeneration or nursery habitats for fish spawning. Connectivity: Preserving the connectivity between coral reefs and surrounding habitats provides healthy coral communities and fish habitat. Effective management: Resilience based strategies are based on reducing threats to maintain healthy reefs. Measurements of effective management of MPAs allows for adaptive management. 1 2 Coral reef conservation program: Addressing key threats NOAA. Retrieved 7 December 2011. ↑ Holling, C.S. (1973) "Resilience and stability of ecological systems" Annual Review of Ecology and Systematics, 4: 1–23. 1 2 3 Reef resilience toolkit model: Introduction The Nature Conservancy Retrieved 7 December 2011. ↑ Fujise, L., Yamashita, H., Suzuki, G., Sasaki, K., Liao, L.M., Koike, K. (2014) Moderate thermal stress causes active and immediate expulsion of photosynthetically damaged zooxanthellae (Symbiodinium) from corals PLoS ONE, 9(12): 1-18. ↑ Sampayo, E.M., Ridgway, T., Bongaerts, P., Hoegh-Guldberg, O. (2008) "Bleaching susceptibility and mortality of corals are determined by fine-scale differences in symbiont type" PNAS Environmental Sciences, 105 (30): 10444–10449. ↑ Palomares, M. L. D. and Pauly, D., eds. (2011). "Oculina patagonica" in SeaLifeBase. December 2011 version. 1 2 3 Fine, Maoz, Loya, Yossi (2002) "Endolithic algae: an alternative source of photoassimilates during coral bleaching" Proceedings of the Royal Society, 269 (1497): 1205–1210. Oliver, Thomas Andrew (2009) The role of coral's algal symbionts in coral reef adaptation to climate change ProQuest. ISBN 978-0-549-98995-0.